Vigor2862 Series is a VDSL2/ADSL2+ Security Firewall router which is compatible with variants of ADSL and VDSL. All the models have an RJ-11 DSL port, and a Gigabit Ethernet WAN port which can be used with a cable-modem to connect to a second line for load balancing or failover, there are also two USB ports which can work with 3G/4G/LTE USB modems to add wireless connectivity. Vigor2862 Series features comprehensive firewall and content security management (CSM) to secure the local network.It can also be a central management portal for Vigor APs and Vigor Switches, providing Network Administrator a simpler way to maintain all the network devices. Faster Wi-Fi speed 802.11ac Wave 2 dual-band wireless for speed up to 1.7Gbps (ac/Vac model) compared to 1300 Mbps for the Vigor2860. 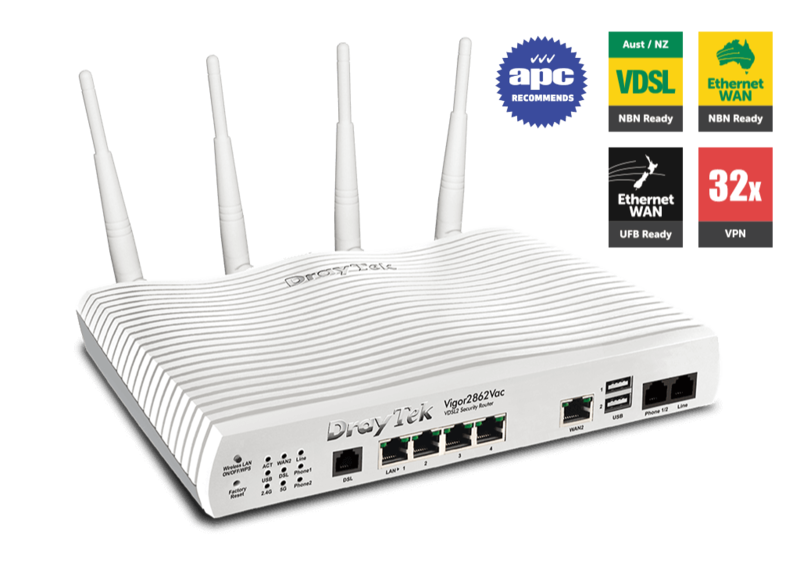 The VDSL/ADSL modem built-in Vigor2862 Series is compatible with various versions of xDSL, including ADSL, ADSL2, ADSL2+, VDSL, and VDSL2, automatically fall back is also supported. 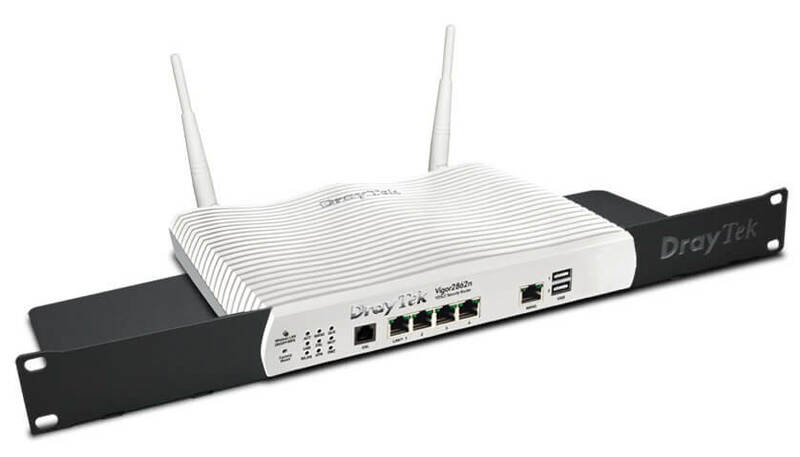 Except for the DSL interface, there is also a Gigabit Ethernet WAN port that can be used for any types of connection and add an additional connectivity to share the traffic load. 3G/4G/LTE USB modem can also be attached to the USB ports of the router, and offer wireless Internet connectivity in case the fixed lines are not available, In fact, all of the WAN interfaces can be configured to operated in either Load Balancing mode, which will be active all the time, or in Failover mode, which will be active only when detecting connection loss or heavy load on the primary connection. On Vigor2862 Series, Load Balancing can be set in either IP-based mode, which means the packets destined to different IP address will be distributed across different WANs, or Session-based mode, which means the packets belong to different sessions can take different paths, this allows a multiple-session connection to be established across multiple WANs, and the maximum data rate will be all the WAN’s bandwidth combined. Policy-based Load Balancing is also supported so that you may specify the path for some certain packets. To increase network accessibility more, Vigor2862 Series also support High Availability feature and allows one or more redundant Vigor2862B Series to be added to the network and operated in standby mode. The 4-port Gigabit Ethernet switch on the LAN side provides high-speed connectivity for the servers and PCs on the local network, and the Virtual LAN (VLAN) features allow you to separate the LAN clients into different logical domains thus to increase the security and network efficiency. Vigor2862 Series support 802.1Q standard and can build a Tag-based VLAN system with an 802.1Q-support switch, Port-based VLAN is also supported that each LAN port can be configured as a member of different VLAN and be isolated from each other without the use of VLAN tag. Moreover, up to 8 IP subnet can be set up on Vigor2862 Series, so each VLAN can use different IP addressing space. 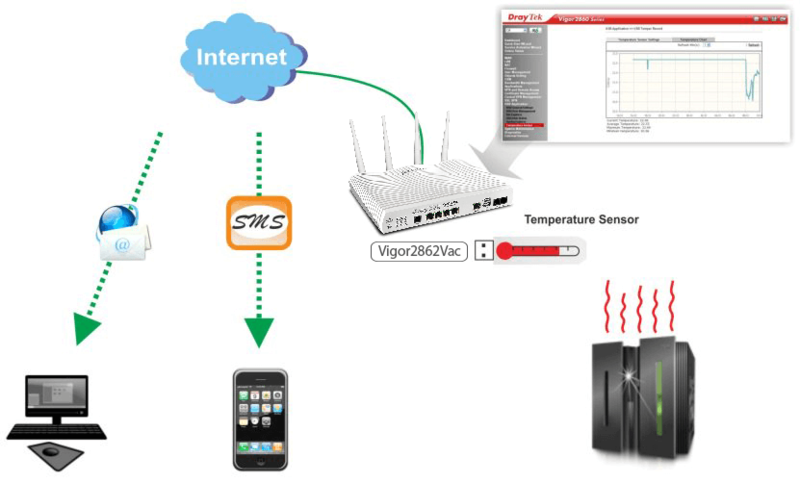 Vigor2862 Series has implemented an integrated solution to work as a public Wi-Fi hotspot. While providing Internet access to the guest users, the Hotspot Web Portal can be used to collect the users’ information, informing the terms and conditions, and presenting a landing page to them. Vigor2862 Series support Stateful Packet Inspection (SPI) Firewall and flexible filtering rules, it can accept or deny packets based on the information in the packet header (such as source IP, destination IP, protocol, and port number) or the packet’s application. IP-based restrictions can be set to filter certain HTTP traffic as well as various application software and help you to prevent time and network resource wasting on inappropriate network activities. With an annual subscription to Cyren Web Content Filtering service, you may also filter the websites by their categories, and set up restrictions to block the whole categories of websites (such as Social Networking, Gambling.. etc.) without the need to specify every site you would like to block. The Cyren service is constantly updating the categorization, and a free 30-day trial is included in every new router. The Vigor2862 Series firewall also includes DoS (Denial of Service) Defense to protect the network against variants of attacks. Vigor2862 Series support both LAN-to-LAN VPN and Remote Dial-in VPN, up to 32 VPN tunnels can be set up simultaneously. All the industry standard tunneling protocols are supported, including PPTP, L2TP, IPsec, and GRE, and it’s compatible with 3rd party VPN devices. Vigor2862 Series also support SSL VPN – a type of VPN based on the very common encryption method which is used by all the HTTPS websites. While the traditional VPN protocols might be filtered by the firewall and NAT of public networks, SSL VPN will be passed as long as the HTTPS is allowed. DrayTek also offers free official client App for Windows, iOS, and Android. VPN Trunking is also supported by Vigor2862 Series, this allows you establish two VPN tunnels to the same remote site but through different WAN interfaces. The two trunking tunnels can be set up in load balancing or failover mode. 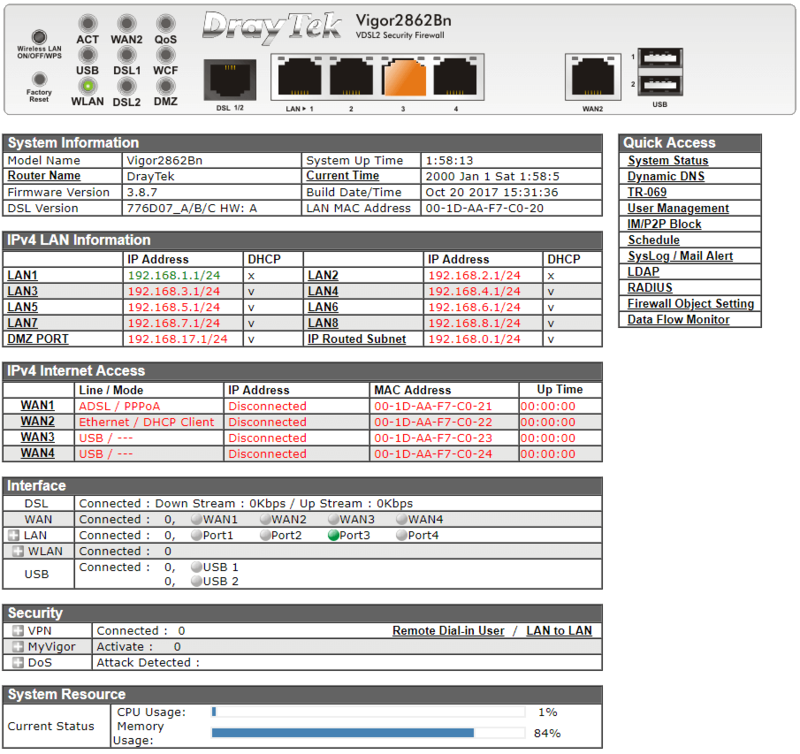 Vigor2862 Series can act as a Central Management portal for all the Vigor devices on the network, including VigorAPs, Vigor Switches, and even Vigor Routers. With Central Management feature, device maintenance (such as firmware upgrading, configuration backup and restore) and monitoring can all be done from a single portal, which is the Web User Interface of Vigor2862 Series. Vigor2862 Series can manage up to 20 VigorAP on its LAN. Automatic Provisioning can be triggered when a VigorAP newly join the network and this makes AP deployment much faster. You may also get the client or traffic history of all the AP from Vigor2862B Series, and set up load balancing rules for the AP. Central Switch Management allows you to manage up to 10 Vigor Switches from Vigor2862 Series, the status of every port can be directly viewed from the router. Vigor2862 Series also support VLAN configuration for the switches, setting that matches the router’s VLAN settings and the switch hierarchy is automatically provided which makes the VLAN configuration much simplified. The Vigor2862 supports up to 8 LAN IP subnets, an IP Routed subnet and a DMZ port. The 8 LAN IP subnets can be assigned to 16 VLANS allowing the creation of logical workgroups to provide additional security and traffic management within an organisation. For example, within a building each tenant or workgroup can be assigned their own IP network. In addition, workgroups can also be located in different physical locations or floors within a building. For example, a Sales Department may be located on the 1st floor of a building, but some of the sales people are located on the second floor and still be part of the sales VLAN. 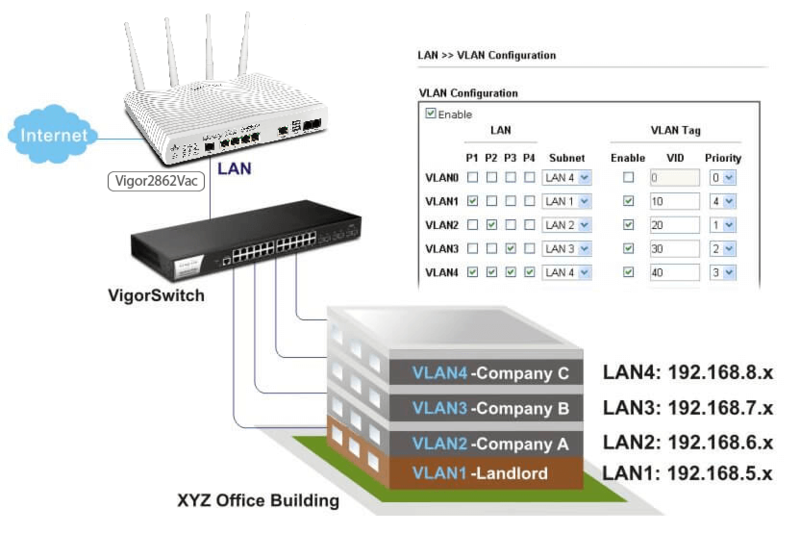 The IEEE 802.1q VLAN trunk feature means that only a single LAN cable connection is required between the router and the VigorSwitch, create a number of VLANs for different departments. The VLAN Tag Priority setting can be used to prioritise traffic for certain VLANS or workgroups. Increase remote access security to your office by combining both VPN and Firewall features in the Vigor2862. The Vigor2862 supports up to 32 simultaneous VPN tunnels (such as IPSec/PPTP/L2TP/SSL protocols) for secure data exchange and communication. In addition, 16 SSL-VPN tunnels are available for teleworkers to access the office LAN. Teleworkers can be authenticated directly with your LDAP server if preferred. The SSL technology is same as the encryption used for secure web sites such as online banking. Security is enhanced by utilising firewall features such as web content and URL filtering in addition to restricting access to P2P traffic and Instant Messaging applications. 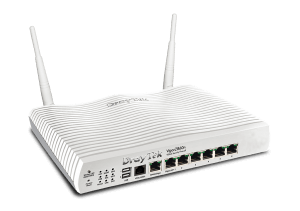 The Vigor2862 series is equipped with ADSL2+/VDSL2 and one Gigabit Ethernet port and two USB WAN ports for WAN load-balancing and backup. This allows backup VPN tunnels to be created to branch office networks to ensure maximum VPN connectivity uptime. In addition, the VPN Trunking feature can be used to set up dual VPN tunnel links to branch office networks to increase bandwidth and provide redundancy and backup to prevent downtime due to one of the WAN connections failing. The Central Management features allow the network administrator to monitor and configure Vigor devices including VigorAPs, Vigor Switches, and even Vigor Routers from a central management console built into the Vigor2862 series router. Maintenance tasks such as firmware upgrades, configuration backup and restoration as well as and monitoring be done from a single portal. VPN management supports 8 external CPE devices and allows the creation and management of IPSec, PPTP or SSL-VPN tunnels from the central Vigor2862 router to the remote routers. The AP Management feature allows the monitoring and auto-configuration of up to 20 DrayTek Access Points connected to the Vigor2862 LAN. Automatic Provisioning can be triggered when a new Access point is connected to the LAN. Other features include client or traffic history of the AP and configuration of load balancing rules for the Access Points. Switch Management allows you to manage up to 10 VigorSwitches. It simplifies the task of configuring VLANS in attached VigorSwitches matching the router’s VLAN settings. It also displays the switch status as well as the network topology through the switch hierarchy feature. The optional USB thermometer can be attached to the Vigor2862 to provide logging of the ambient temperature in the server room. Upper and lower temperature thresholds can be set and when the temperature exceeds these thresholds and alarm is generated. This alarm can be sent to the network administrator via email or SMS to alert them of the environmental issue. 802.11ac Wave 2 can simultaneously stream to multiple users to maximize bandwidth utilization. Vigor2862ac routers now operate 802.11ac Wave 2 Wi-Fi with support for MU-MIMO, TX Beam Forming, 1733Mb/s Link Rate and up to 4 spatial streams. This allows up to 4 wireless clients such as laptops or smartphones to have simultaneous access to a Wi-Fi channel. The result is an increased performance of the Wi-Fi network. The Vigor2862 series router can be rack mounted into a standard 19’ rack or cabinet. The 1RU rack mounting kit allows the front panel of the router to be easily accessible as well as keeping it secure in the communications rack.